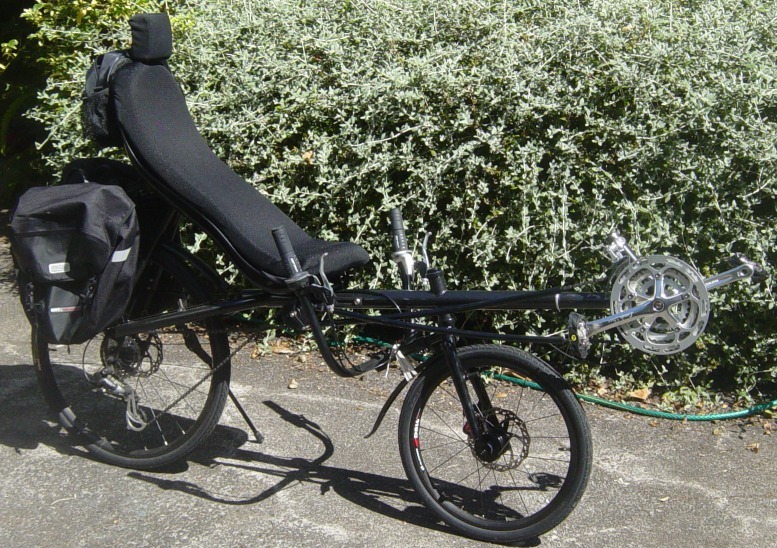 A recent “warranty issue” (I broke my frame) had me checking out bikes on TradeMe where I found a reasonably priced recumbent. I’d been thinking about getting one for quite a few years, so I took the cue and bought it. The seller was John Fisken at http://www.recumbents.co.nz/, who regularly imports recumbents to sell on. He’s been helpful in getting me on the road (although I am pretty motivated with bicycles) and provided me lots of advice. This one was manufactured by twbents.com. The first ride was very weird. And very wobbly. It’s probably as close as I’ll get to learning how to ride a bike again. I had someone to steady the bike as I rode the first little bit, and pretty soon I was able to get around without wobbling too much, although turning was pretty tricky. I’ve been regularly riding upright bikes for over 25 years now, so it will take a long time for my perspective to catch up. Perhaps the strangest sensation is being on top of the bicycle, instead of feeling as one with it. Whenever I hit a bump I think about the possibility of being bounced off the bike, since I feel precariously balanced there. There is only one frame size, the seat and pedal boom are adjustable to accomodate different heights. Additionally the seat angle can be changed, and the handlebars too. This means an awful lot of fiddling in order to get things comfortable. I had some issues with the seat mounting, but a bit of drilling and adjusting the bolts got it straight. I’m 182cm tall, and its comfortable at the maximum boom extension and seat all the way back. The most difficult part was obtaining the extra few links of chain that I needed for the extended boom. It took a few more rides around the neighbourhood and a long trip on a cycle path before I felt comfortable enough to take it into traffic on the main roads. After that I braved the rush hour traffic and commuted into town daily for a few weeks. It helped me become comfortable on the recumbent, but also convinced me that it’s not an appropriate bike for city riding. Because you have to raise your legs high to start pedaling, you need to balance while the bike is stationary, unlike an upright bike where standing on the pedals starts the bike moving immediately to give you balance. This is particularly difficult on hill starts, and can be nerve-wracking at the lights when there’s traffic behind. The bike is not as agile as an upright bike, it’s longer which makes cornering more difficult, and it’s not practical to move your weight forward or backward to deal with bumps on the road or going up curbs. Finally, you are much lower than on an upright bike, which prevents looking over cars to see other road hazards. This weekend I finally took the bike out for a long ride, through the suburbs and then out into the more rural areas to the south east. I think I covered about 80km in four and half hours, which isn’t far off from my other bikes. It was definitely more comfortable than an upright bike, although my bum was a little sore at the end. Hills are a bit tougher, you don’t have the flexibility to stand up for extra power if you need it, but the real issue is that you can’t stop before the top because starting again is such trouble. You need to climb in a low gear with high cadence, which is my preferred style anyway, and I don’t like to stop until I’m at the top. The position gives good visibility, and means you can enjoy the scenery a lot more, especially since you’re not thinking about sore arms, back and bum. I’m very happy with it, and will definitely use it for my country rides in the future. You can see the rack and paniers I’ve installed (birthday present), now all I need is the opportunity for a cycle camping trip. When friends come to visit I like to give them a taste of something special from Aotearoa. 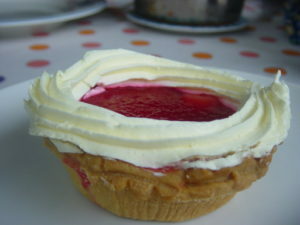 Last time it was Jelly Pie, more unique than I realized. What was once a staple at my high school tuck shop was now an almost unknown oddity. Missing from the supermarkets and dairies I tried, and requests for it meeting with blank stares. 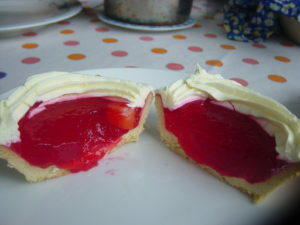 Family friends began to doubt its existence, and my quest hit rock bottom when even internet searches couldn’t produce any mention of the existence of the classic New Zealand Jelly Pie. 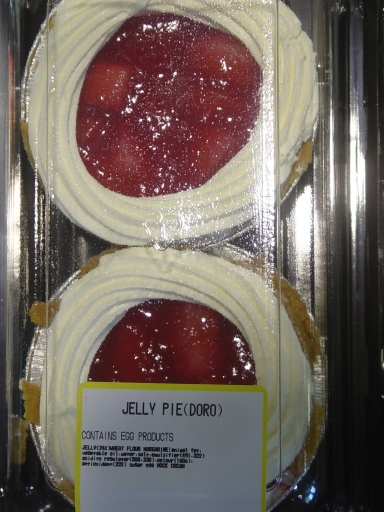 So, I decided to rectify this terrible omission, and located a Jelly Pie at our local Pak ‘n’ Save. Here are the pics to prove it. 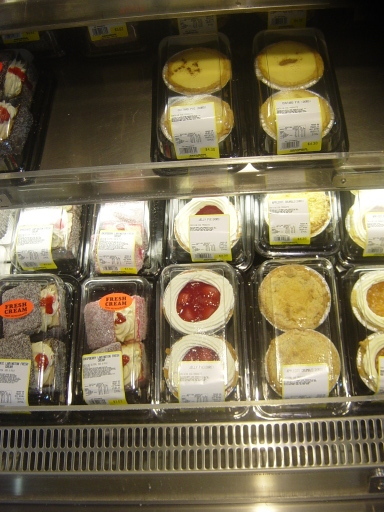 I see custard pie and apple pie, but what’s that between the Lamingtons and the Applecot Crumble? And there it is, Jelly Pie in all its glory. 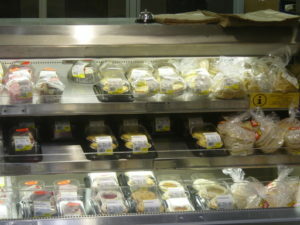 The ingredients give a good indication of the experience of eating it. Although I do wonder why fruit isn’t listed, is it an omission, or are those apparent chunks of pear in fact something much more sinister? After the family taste test in which Grandpa gave up half way through his piece and my daughter held her nose while chanting “disgusting”, I think I understand why Jelly Pie hasn’t made an international sensation. Perhaps one day in the future someone will create a gourmet version.